Product #60574 | SKU 3-101 | 0.0 (no ratings yet) Thanks for your rating! 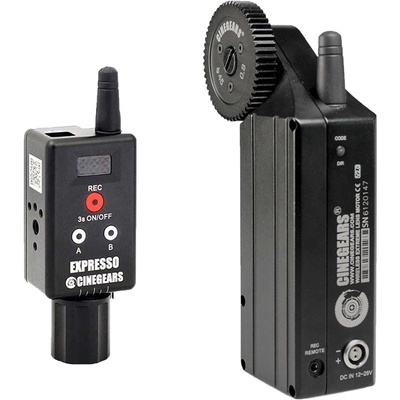 The Cinegears Single Axis Wireless Follow Focus Mini Controller Kit with Extreme High Torque Motor features a small-sized wireless controller with a full-sized handwheel. It allows you to set up a wireless lens control motor and controller system on your camera system equipped with geared lens and either 15mm or 19mm support rods. The lens controller does not have physical hard stops, but it does allow you to adjust the end points to programme focus stops. The kit includes a rod clamps with mounting brackets, one each 15mm and 19mm rod clamps, allowing you to mount the included lens control motor on either size rod. A second included rod clamp for a 15mm rod is approximately 7.62cm long. In addition to the replaceable cinema-style drive gear that comes with the lens control motor, the kit includes four different replacement gears with a gear mod of 0.5, 0.6, 0.8, and 1.0 , in case you have to drive lenses with non-cine-style gearing or plastic lens gears. The included gear re-locator allows you to use lenses that focus in the opposite direction from standard, without having to alter your focus-pulling technique for those lenses. The kit fits into a waterproof case with foam inserts to protect your equipment during transport and storage. The Cinegears Single Axis Wireless Mini Controller is a wireless follow focus controller that easily pairs with a CINEGEARS wireless motor. You can use the controller for focus, zoom, or iris. The controller operates on a frequency of 433 MHz, providing a range of up to 198' (60m) line of sight. The wireless controller and optional motor combination provide simple auto lens calibration and manual lens remapping for easy lens changes. The Mini Controller features a removable full sized marking disc, a built-in rechargeable battery with approximately eight working hours of power per charge, 15 selectable speeds, and allows you to programme up to two focus presets. It incorporates a start/stop record trigger button and small LED screen that shows focus depth. The Cinegears 2" (5.08cm) Rod Bracket for Lens Control Motors mounts on a 19mm support rod and allows you to mount your Cinegears lens control motor on your rods and drive your lens's geared focus, zoom, or iris. It features a spring-loaded locking lever that allows you to tighten the bracket on the clamp, while at the same time securing the motor to the clamp. The Cinegears 3.1" (7.87cm) Rod Bracket for Lens Control Motors mounts on a 15mm support rod and allows you to mount your Cinegears lens control motor on your rods and drive your lens's geared focus, zoom, or iris ring. It features two spring-loaded locking levers; one that allows you to tighten the bracket on the rod, and a second locking lever that secures the motor to the clamp. The Cinegears 4 x 38mm Diameter Replacement Gear Set for Cinegears Lens Motors features 4 lightweight plastic gears that allow you to drive most geared cine or ENG-style lenses. The gears can replace the original aluminium drive gears for Cinegears lens motors, providing a cost effective solution to handle surprises in the field. Each gear is only 38mm in diameter, and features a captive mounting screw. The smaller diameter of the replacement gear, as compared to the standard drive gears, may provide smoother movement as you drive the lens with your motor. Each gear is labelled allowing you to easily select the right gear for your lens. The gear marked 0.8 is for cine-style lenses. Gears marked 0.5 and 0.6 are standard for ENG-style lenses. The Cinegears Motor Gear Re-Locator consists of a chrome plated stainless steel spacer that allows you to position your drive gears about 0.5" (1.27cm) from the normal gear location when using your Cinegears motors. The spacer is made of the same material, chrome-plated stainless steel, as the inside of the Cinegears metal gear to prevent gear stripping.Included with the gear spacer is an attachment screw, which is needed to attach your drive gear to your motor with the spacer in place.